- Buying AUD/NZD best way to bet on Aussie recovery, analysts say. - RBA minutes and NZ CPI could push AUD/NZD higher this week. - And RBNZ's May meeting could drive it even higher still next month. The Australian Dollar could be further buoyed this week by developments around the domestic and global economies while the New Zealand Dollar has a tough month ahead of it, which could make bets on a rise in the AUD/NZD rate a good idea, according to multiple analaysts. 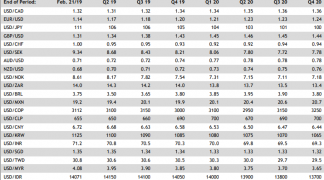 The Australian and New Zealand's Dollars have both risen this year and now occupy the third and fourth spots in the G10 league table for 2019, after partially recovering from what were punishing losses late in 2018. Both currencies still face a number of tests up ahead but this week will provide the Aussie with scope to recover further lost ground from many of its rivals, and particularly against the Kiwi Dollar, which is expected to suffer ahead of the May Reserve Bank of New Zealand (RBNZ) meeting. "This week, we think the risk is that forward spreads move in AUD’s favour. Tonight’s RBA minutes will be picked over for signs that the RBA will soon move to an easing bias, but recent comments from officials suggest neutral remains more likely," says Elsa Lignos, head of FX strategy at RBC Capital Markets. Australia's Dollar has been under pressure since late February when the Reserve Bank of Australia (RBA) began to retreat from earlier guidance that had suggested the next move in interest rates would be up. It now says the next move could be either up or down. Since then financial markets have been betting heavily the bank will cut its interest rate before the year is out, with pricing in the overnight-index-swap market implying that investors expect two full rate cuts before year-end. Markets will scrutinise minutes of the latest RBA meeting overnight in the hope of gauging just how worried about the economic outlook the RBA has become. RBC's Lignos says there's a danger the minutes will leave the market looking as it's gotten ahead of itself. 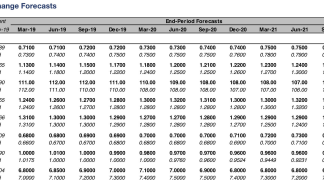 "Further signs that aggressive stimulus in China is starting to pay dividends in stronger activity (retail sales, industrial production, GDP all due Wednesday) would also support AUD against other G10 currencies, including NZD," Lignos writes, in a note to clients Monday. Above: AUD/NZD rate shown at daily intervals. 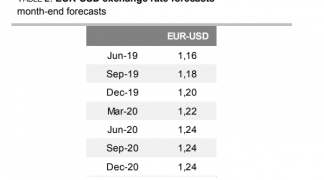 Lignos has recommended that clients of RBC buy the AUD/NZD rate this week, targeting a move up toward the 1.0780 level, because that exchange rate could also rise if the New Zealand Dollar weakens in response to first-quarter inflation data due to be published this week. New Zealand inflation has been below the midpoint of the RBNZ's 1%-to-3% target for around seven years now and another reading that puts the consumer price index even further away from the 2% level this week could easily send the Kiwi Dollar lower. This is because another inflation disappointment could be all that's necessary to seal the deal on May interest rate cut from the RBNZ, and markets have not yet fully priced such a move. Investors have been betting that Kiwi rate cuts won't come until August at the very least. Lignos is not alone either. "Given the recent improvement in local data and the rebound in China, we think risk/reward favours a higher AUDUSD. However, due to weaker domestic conditions, we do not expect AUDUSD to materially benefit from stronger growth abroad. Due to the limited upside, we think the best expression of AUD would via a long AUDNZD position to benefit from idiosyncratic weakness in New Zealand," says Hans Redeker, head of FX strategy at Morgan Stanley, in a recent note to clients. Morgan Stanley's Redeker likes the idea of buying the Aussie generally but is only advocating that clients bet on the AUD/NZD rate so far. He is targeting an even bigger move than Lignos, although RBC's trade idea is for this week alone while Morgan Stanley's is intended to run for longer. Above: AUD/NZD rate shown at weekly intervals. Redeker is looking for a move up to the 1.09 threshold and has placed a stop-loss at 1.0438. The AUD/NZD rate was quoted 0.14% higher at 1.0616 Monday and has risen 1.29% this year. "Important to watch will be the RBA's tone in the upcoming weeks. Should the RBA maintain its current stance to remain "balanced", this could remove the expectation for a dovish bias and lead to further AUD strength. Risk to the trade includes a rebound in growth conditions in New Zealand leading to a less dovish RBNZ and a stronger NZD," Redeker wrote, in a note to clients last week. Any rebound by the Australian Dollar this week could also send the Pound-to-Australian-Dollar rate lower because this exchange rate has been caught in the headlights of the Brexit calamity playing out in the UK parliament which, for the time being at least, is now on its Easter recess. That means no Brexit news to provide and upward or downward impetus for Sterling, which could leave the Pound-to-Australian-Dollar rate at the beck and call of a resilient if not resurgent Aussie. The Pound was 0.46% higher at 1.8268 against the Aussie Monday and has risen 0.95% for 2019. Above: Pound-to-Australian-Dollar rate shown at daily intervals. A low first quarter inflation rate has strengthened the case for Reserve Bank of Australia (RBA) to cut its interest rate, which will have the knock-on effect of weakening the Australian Dollar, says asset manager AMP Capital. The Australian Dollar was lifted overnight by official data that revealed a further improvement in Australia's terms of trade that has lifted the fundamental value of the Antipodean currency, which Societe Generale has said is a buy if it can close above the 0.70 level against the U.S. Dollar this week. The Australian Dollar was hammered on Wednesday as traders dumped the Antipodean currency after official data revealed surprise falls in both key measures of inflation during the first-quarter, raising pressure on the Reserve Bank of Australia(RBA) to cut its interest rate. The Pound is up against the Australian Dollar at the start of the week but we note the near-term outlook remains negative for this exchange rate and therefore look for further losses.